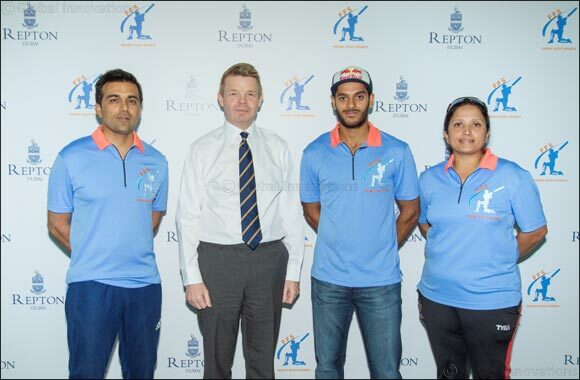 Dubai, United Arab Emirates (May 10, 2018) - Indian-born UAE National cricket player, Chirag Suri and Repton School Dubai have teamed up to announce the official launch of Front Foot Sports, delivering the highest level of cricket coaching to budding cricketers. The new cricket academy, located at Repton School, will offer specialised training and guidance in overall physical and sports training, with the school’s comprehensive facilities including indoor and outdoor cricket nets and impressive floodlit cricket ground, providing young students with a first class environment in which to learn and practise the sport. Chirag Suri is a former pupil of Repton School, and he will be providing coaching at the new facility which is slated to become a globally renowned prestigious academy. He is joined by Khurram Khan, former UAE National Cricket Team Captain and Roopa Nagaraj, UAE National Senior Women’s Cricket Team Member. The new facility is open to all UAE children, youth and adults, both males and females, aged from four onwards, with Repton School pupils offered a complimentary two hour long training session once a week. Front Foot Sports provides an unparalleled coaching programme designed by specialists in the field. The programme guarantees a holistic approach to professional coaching, personalised strength and conditioning along with performance and lifestyle mentoring. David Cook, Headmaster at Repton School Dubai, expressed his delight in the school’s partnership with one of the best and most highly esteemed cricketers in UAE and a former Repton student: “The UAE’s cricket team is on the crest of a wave currently and the sport has been elevated considerably in the past few years which has encouraged both girls and boys to take up the sport. We are very pleased to be offering our facilities as part of the collaboration with our former pupil, Chirag and Front Foot Sports. Assisting budding talented players from across the UAE to develop their skills and enable them to go on and compete at top competitive levels is our aim. Our own pupils will also be able to benefit from this very exciting collaboration that contributes further to our reputation as a school for sporting excellence and achievement. The academy will be led by fully qualified coaches and is suitable for all abilities and ages, starting from 4 onwards. The academy will organise international tours and games, leverage technology through bowling machines, and offer scholarships to potential individuals.